» Oregon bill: Save the mammoths! 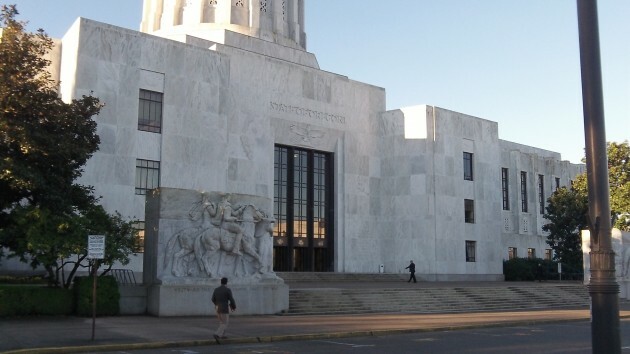 Oregon bill: Save the mammoths! Our Oregon Capitol, where even extinct species are not a lost cause. There’s not much the Oregon legislature can do to save the mammoths, which died out 10,000 years ago, but it is apparently going to try. You’d think that not even members of the Senate Judiciary Committee can protect a species that’s already extinct. But then why ban the sale of items made from mammoth teeth or tusks? According to the bill, ivory is anything made from the tusk or tooth of an elephant, hippopotamus, mammoth, narwhal, walrus or whale. The only institutions that could acquire or sell such items under the bill are museums and universities. So if you had an item containing ivory passed down from your grandparents, say, and tried to sell it to an antiquities dealer, you would be committing a misdemeanor punishable by up to 30 days imprisonment and a fine of $1,250 or twice the market value of the item, whichever was higher. If you got caught committing this crime again, the minimum fine would go to $6,250. The effect is obvious: All such property owned by Oregon residents would immediately become worthless except for its sentimental value. Why would the judiciary committee, of all people, introduce a bill robbing people of the monetary value of their property? In order to save elephants and those other animals from being slaughtered for their teeth and tusks, that’s why. But all the ivory in Oregon now is from animals that are already dead. Barring its sale saves not a single specimen, even if Oregon were the only place in the world where ivory is for sale. At the March 24 hearing, the committee will consider an amendment that allows ivory to be sold if it’s no more than 20 percent of guns and knives that are at least 100 years old. The same exceptions also would be made for musical instruments whose owners can prove the items were made before Jan. 18, 1990. As for the 20 percent rule, you’d presumably have to break the things apart and weigh the wreckage separately to establish this. This legislation is exactly what the President’s clean air act is designed to stop – polluting the atmosphere with ozone depleting hot air and gasses produced from bovine excrement decomposing. Besides I believe there is already a federal law which addresses what Senate Bill 913 does.